The friendly rivalry between Oregon and Washington has been waged over many issues—we are pleased that it should also be waged over Dr. Robinson, who majored in physics at Reed and wrote her thesis on the Brown-Twiss effect on the bunching of photons with Prof. Dennis Hoffman [physics 1959-90]. After Reed, she earned a PhD from MIT in geophysics, then worked for the House Committee on Science, Space and Technology; the Office of Management and Budget; the Congressional Budget Office; and NASA, where she has served as Chief Financial Officer since 2009. 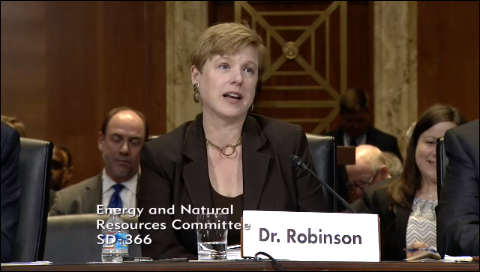 Robinson concluded her testimony before the committee by saying, “I believe public service is a duty, a privilege, and an honor.” We hope the Senate confirms her appointment, and that the spirit of reaching across the river gains further traction in Washington.